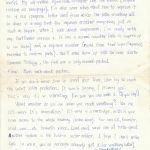 January | 2018 | got papers? 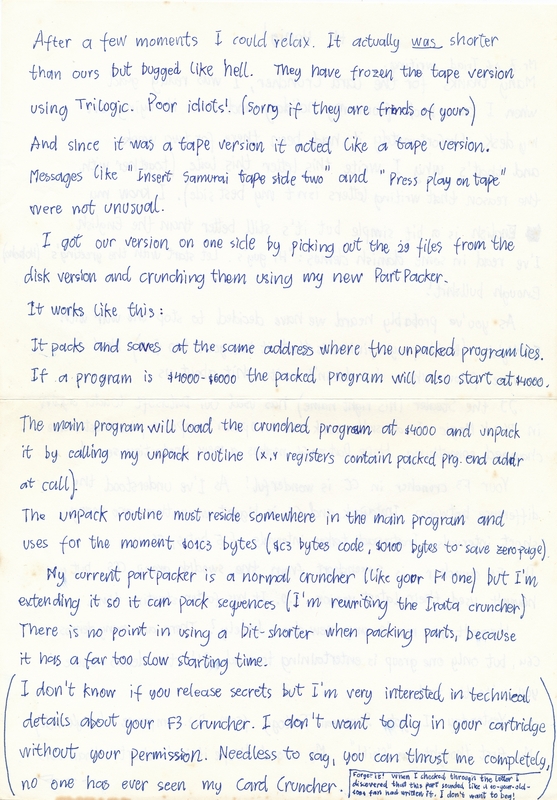 Thanks to the efforts of Lotek Style, we were able to receive materials that are among the oldest we have. 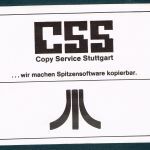 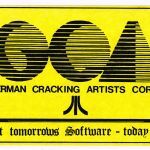 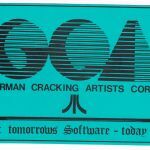 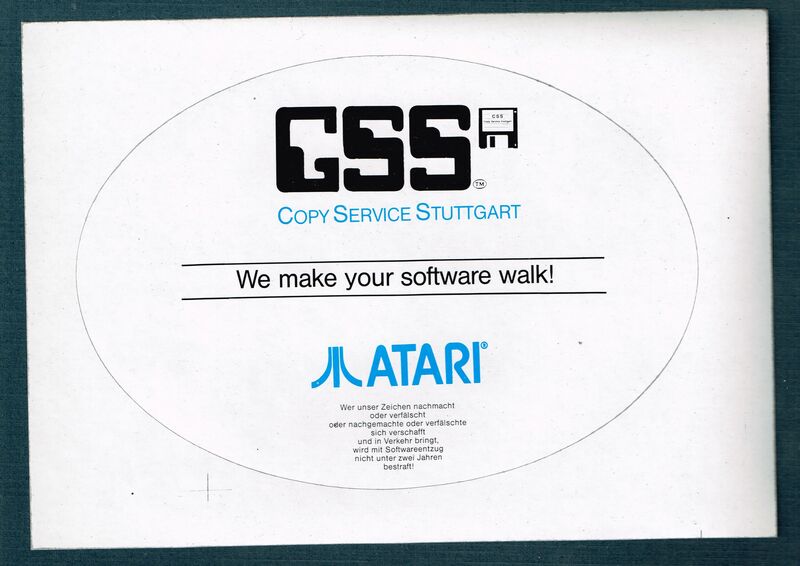 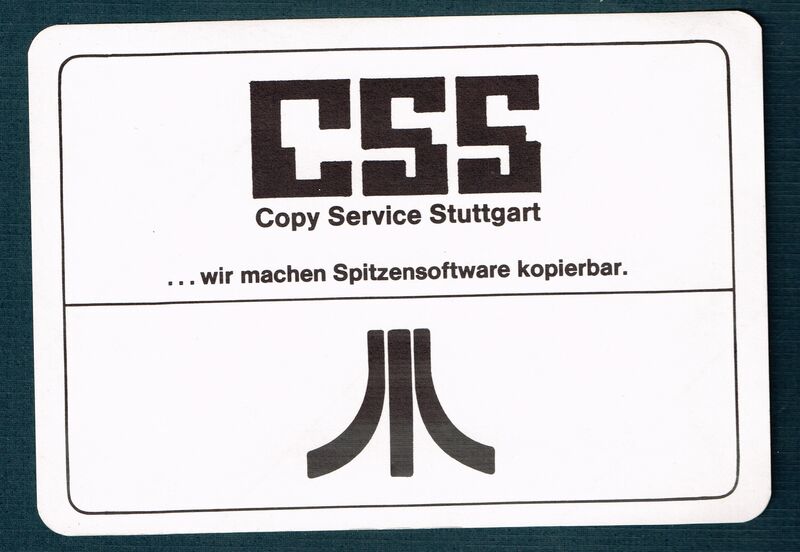 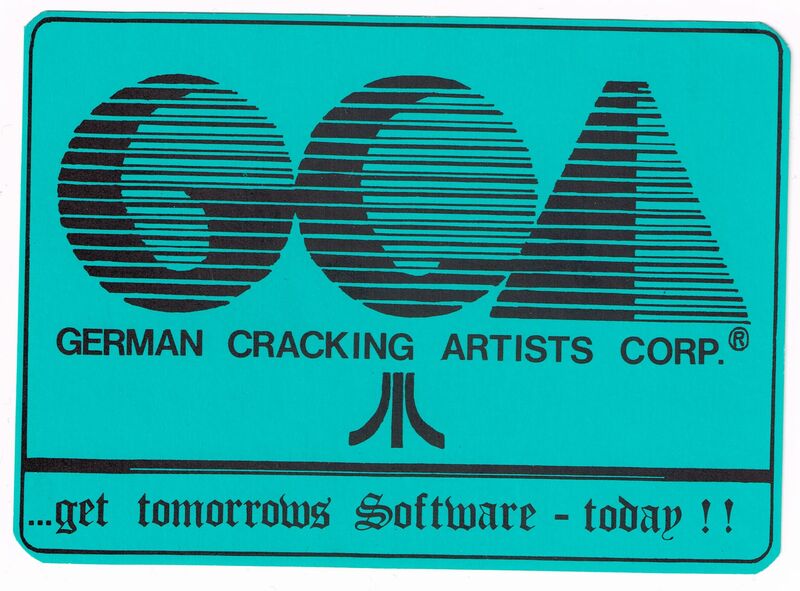 Old German Atari cracker Arthur Dent from the group Copy Service Stuttgart (founded in 1983-84!) 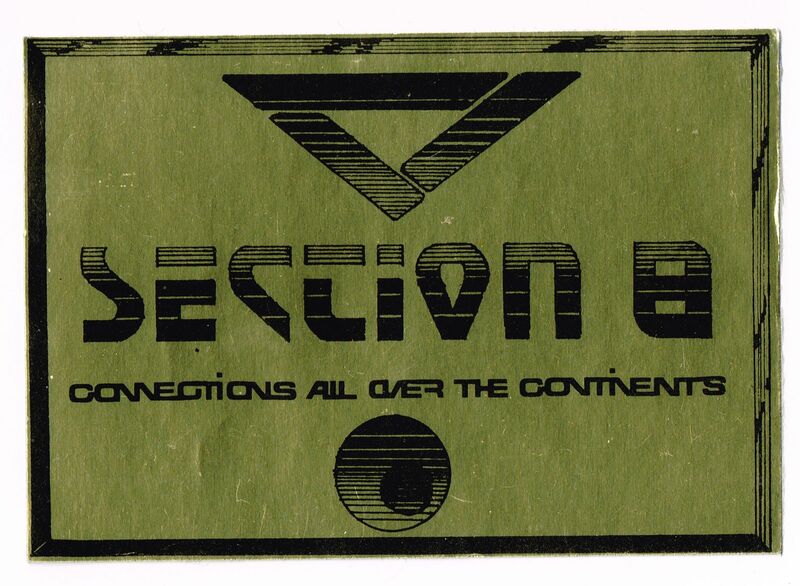 has kept these five stickers for over 30 years. 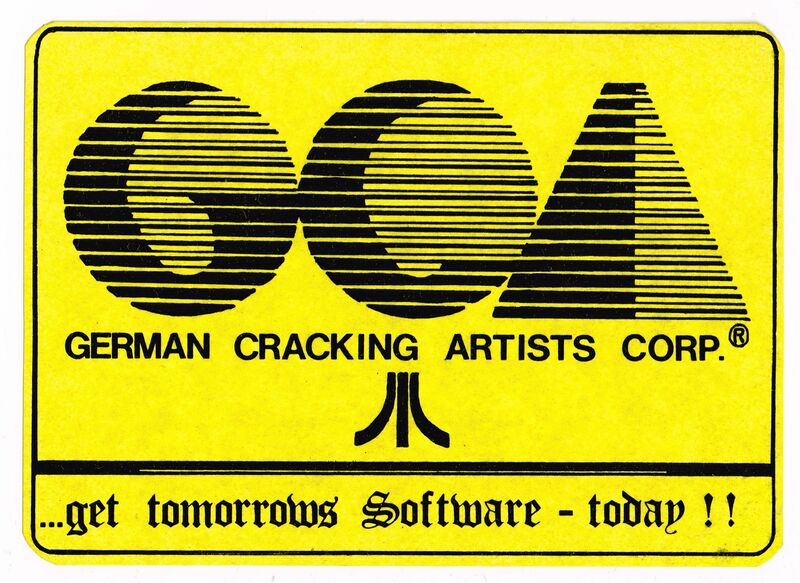 They show that as early as in the mid-1980s, cracking groups were into clever “culture jamming” and appropriated well-known trademarks with a pinch of humour. 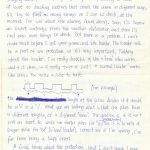 We’re back from a long hiatus – with some spectacular material! 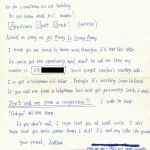 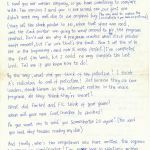 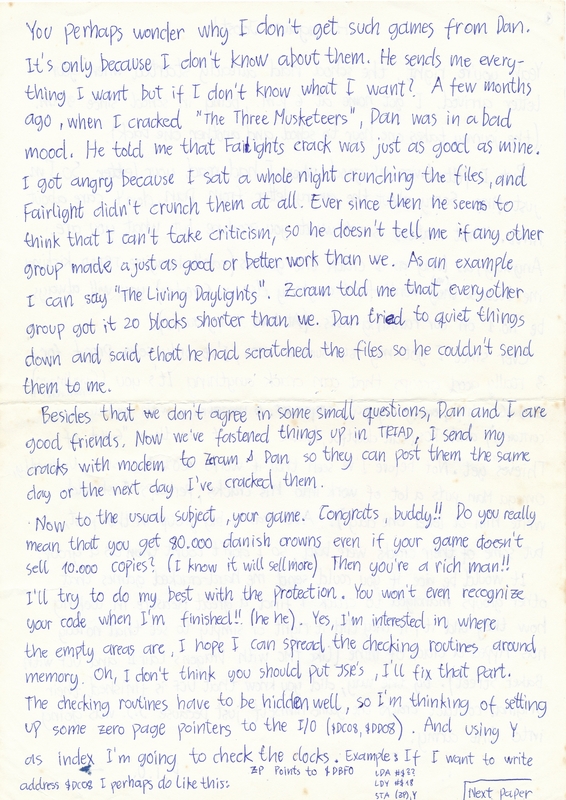 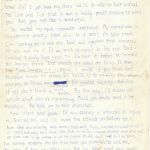 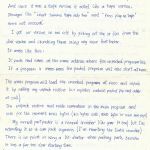 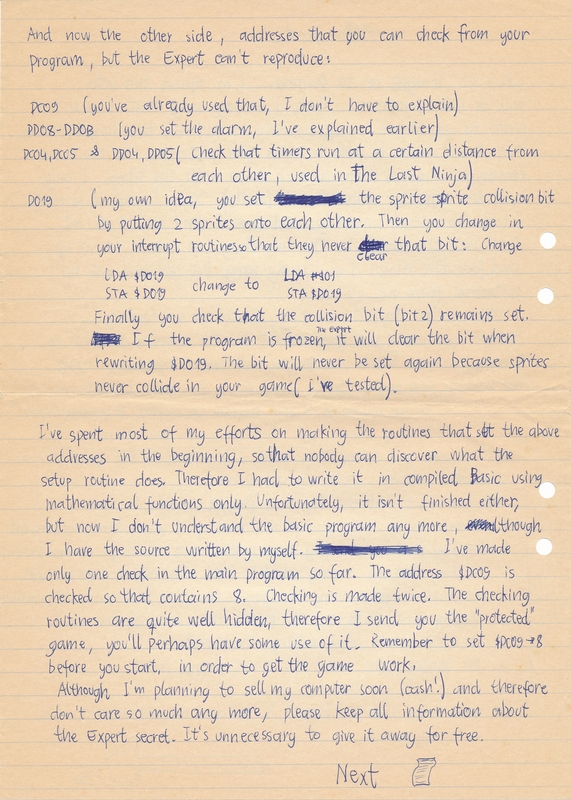 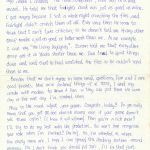 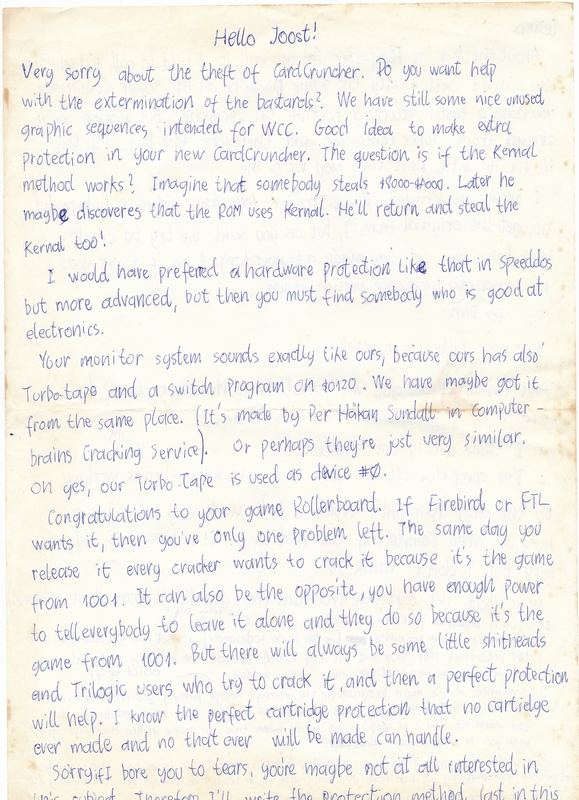 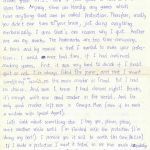 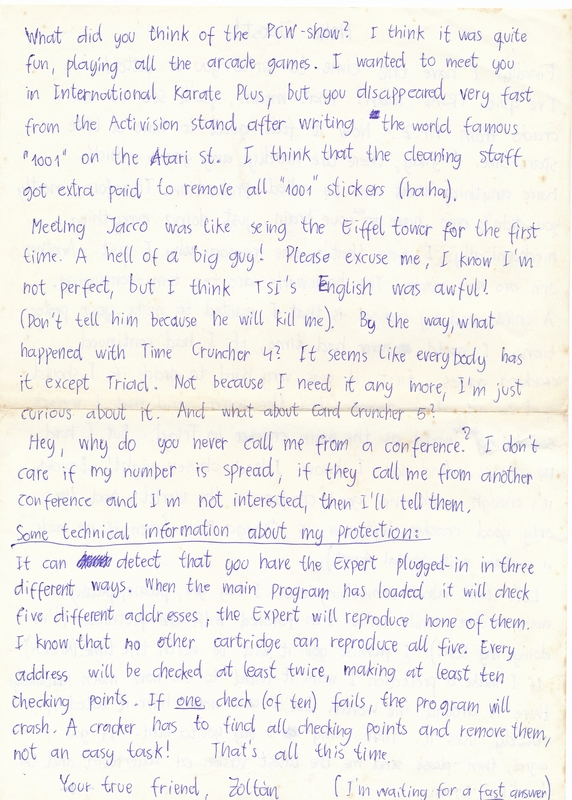 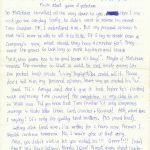 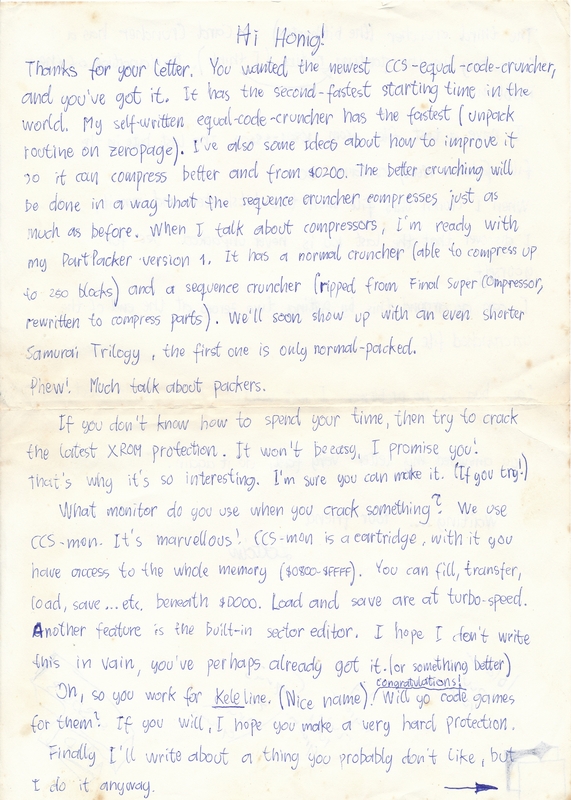 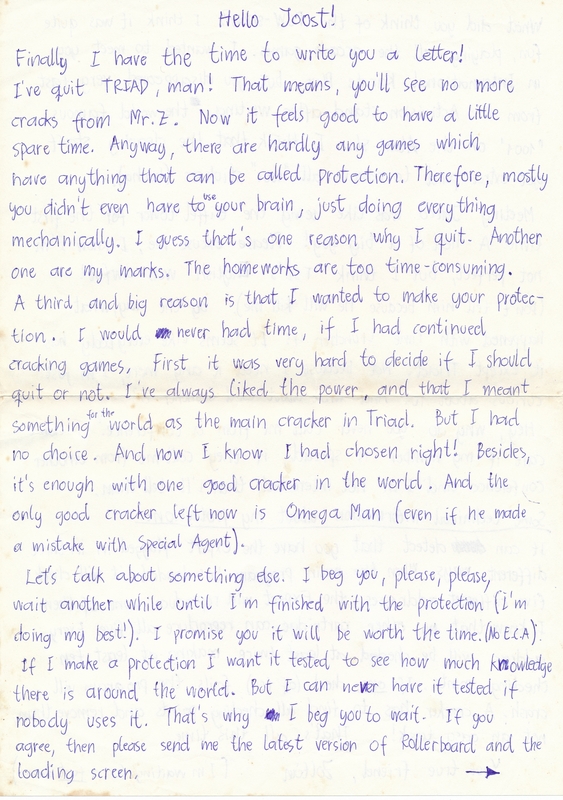 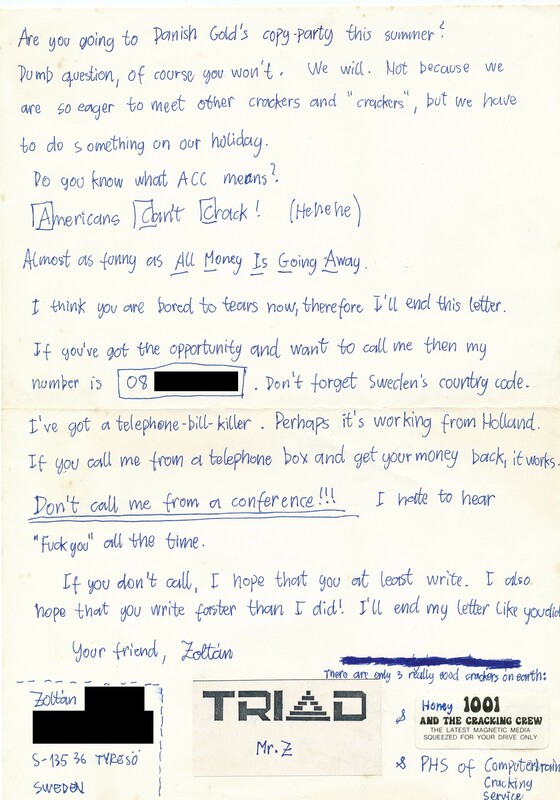 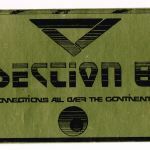 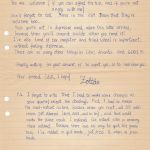 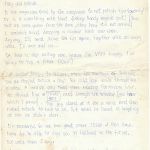 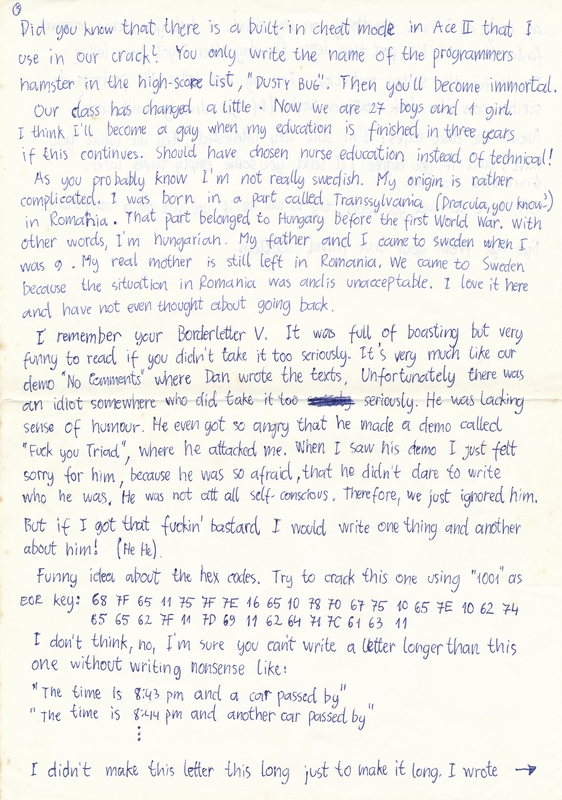 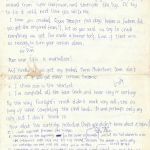 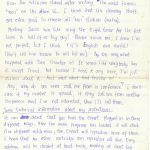 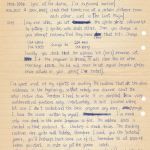 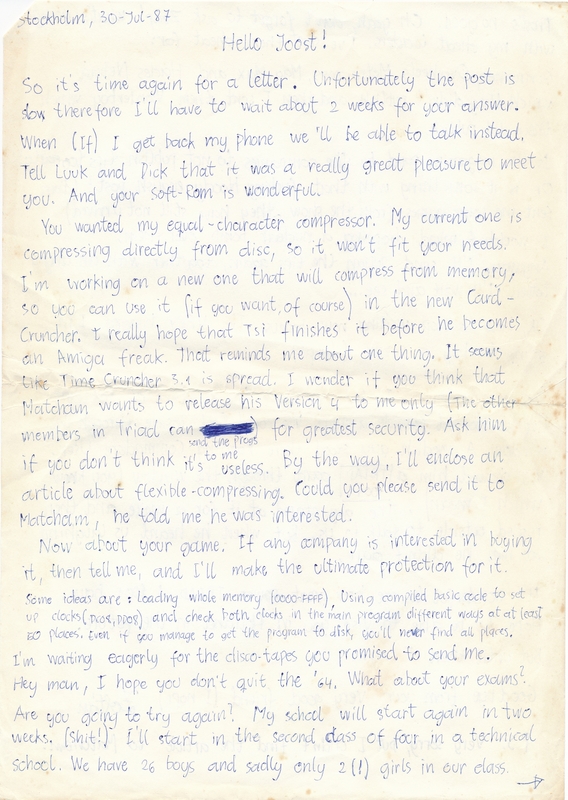 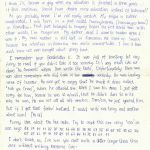 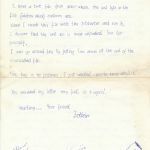 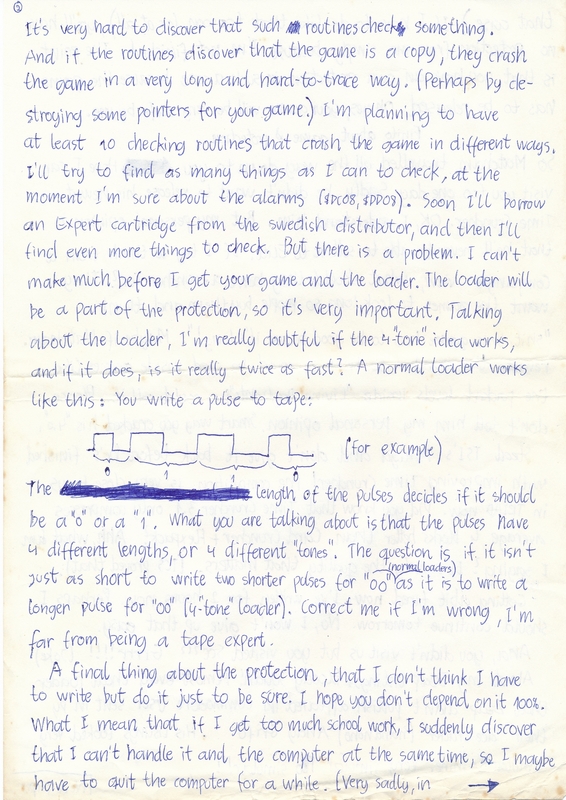 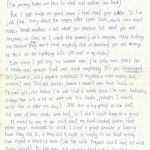 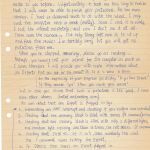 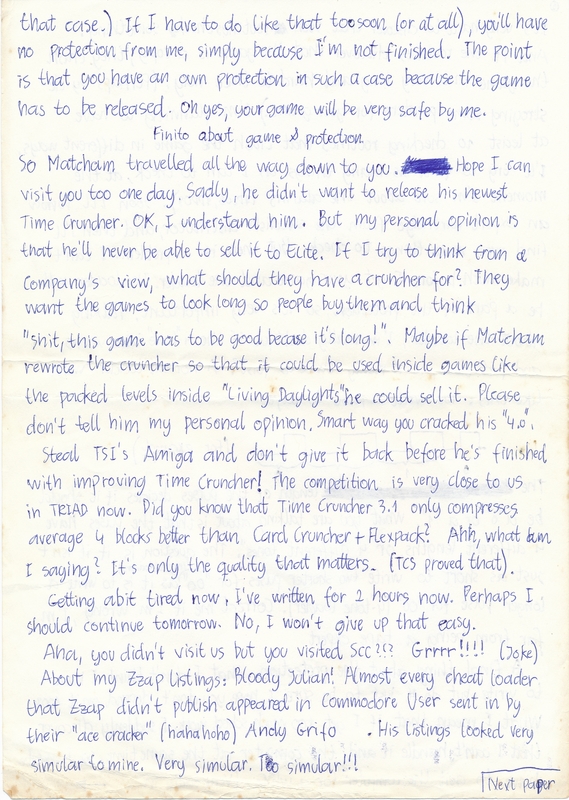 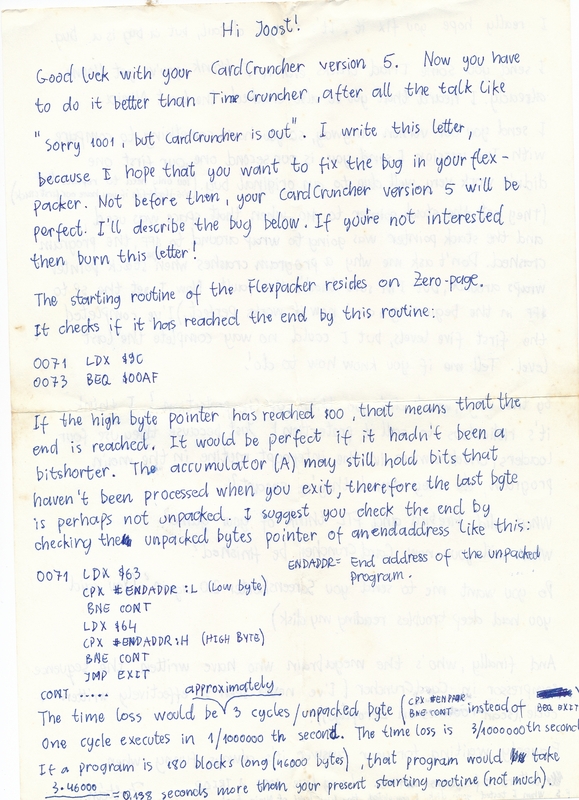 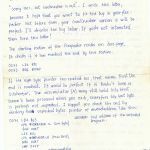 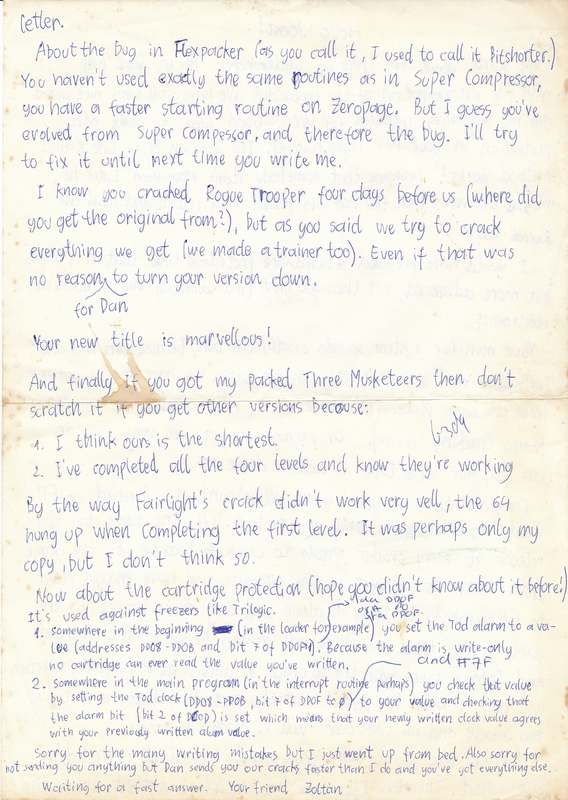 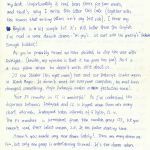 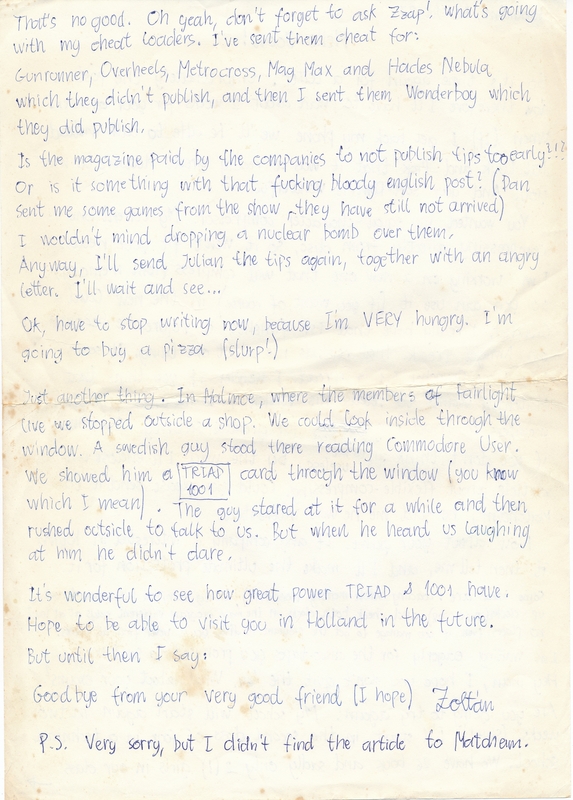 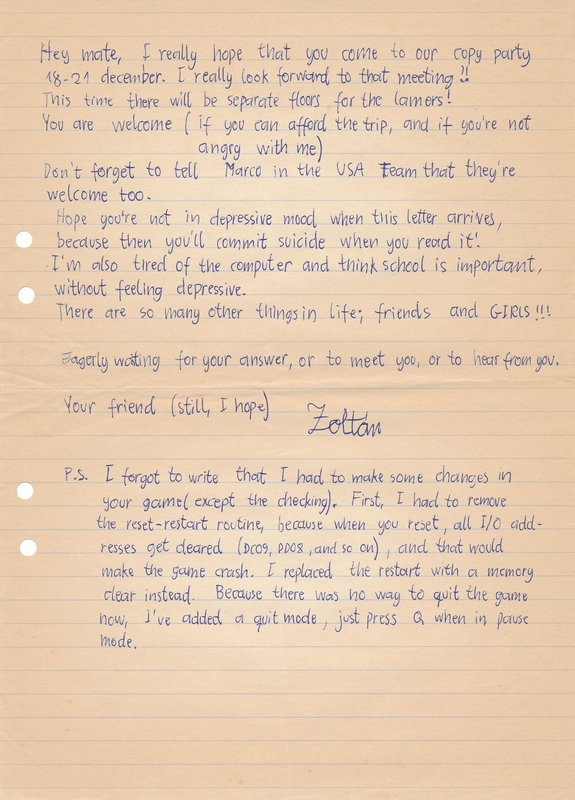 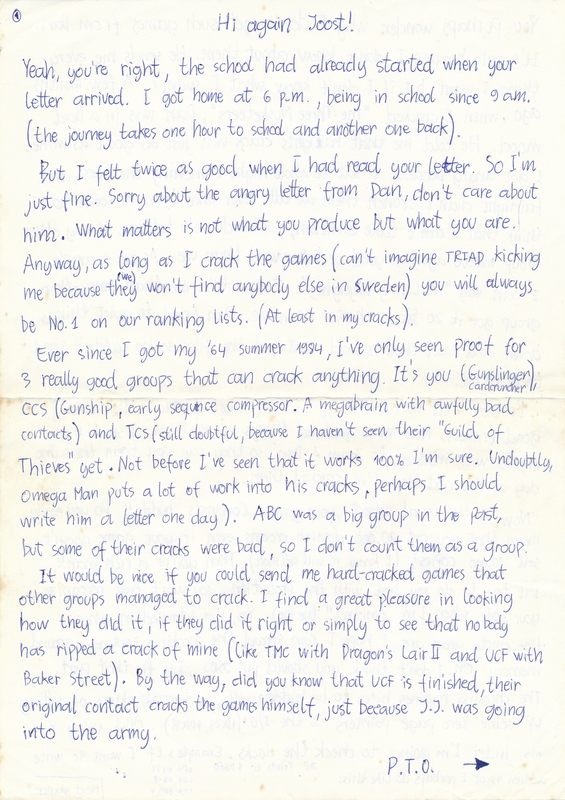 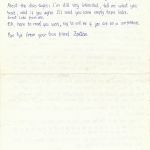 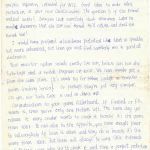 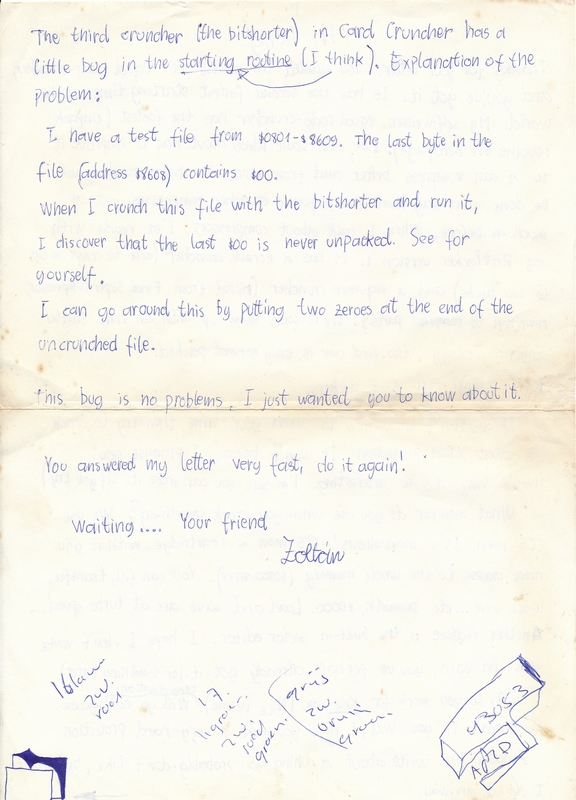 In another instalment of scans from the archive of legendary Dutch C64 coder Honey of the 1001 Crew, we present you with letters that were written to him by a equally legendary scene protagonist: Mr. Z, the founder of the famous Swedish C64 cracking group Triad. 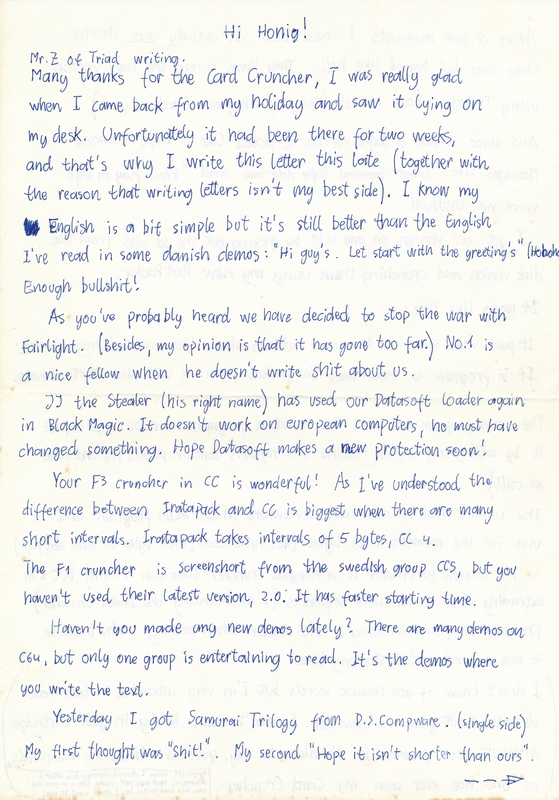 Written throughout the year of 1987, these eight long letters are a treasure trove in various aspects. 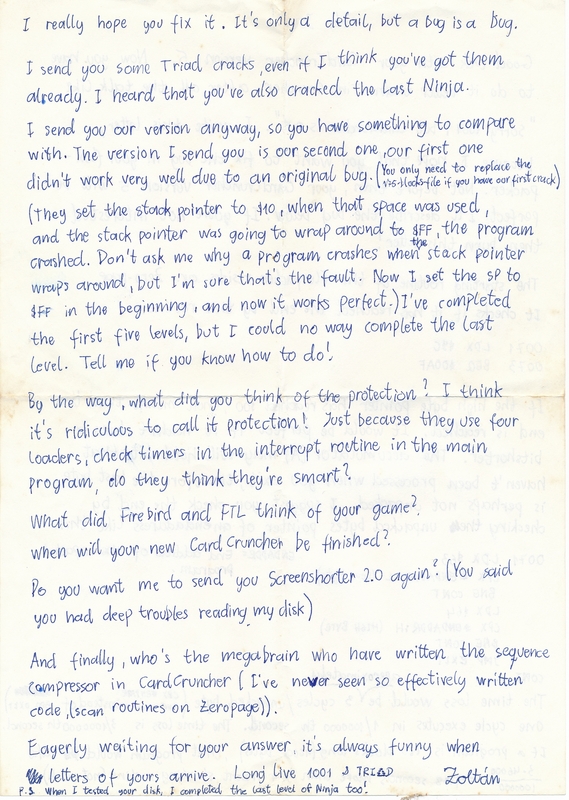 If you are a veteran cracker yourself, or simply someone who is interested in copy protection, you will enjoy reading a top cracker discussing protection methods and their circumvention – especially since in one of the later letters, Mr. Z offers to write the copy protection for Honey’s first commercial game. 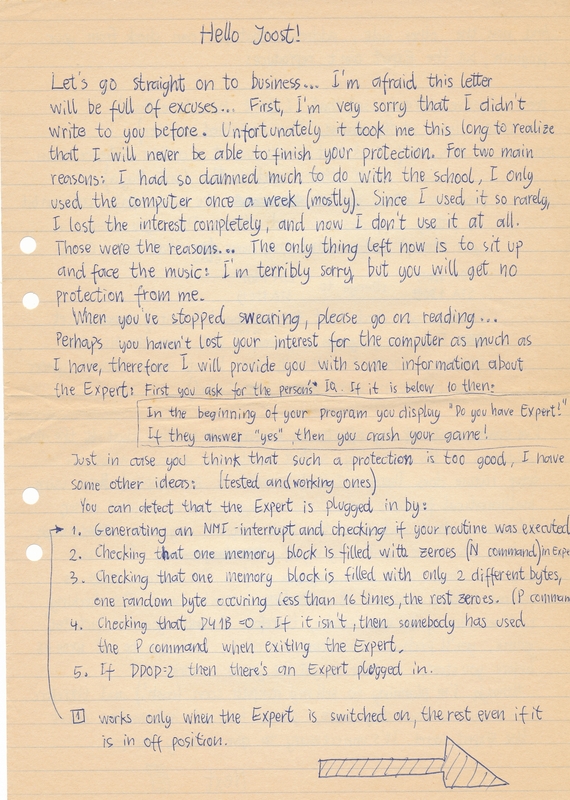 And this is another aspect of interest for those who are into home computing and scene history: Here, we can observe a generation of elite sceners making their first steps from the subculture into the industry – while still being basically schoolkids, discussing sophisticated code and their first business deals alongside the latest pranks and scene gossip. 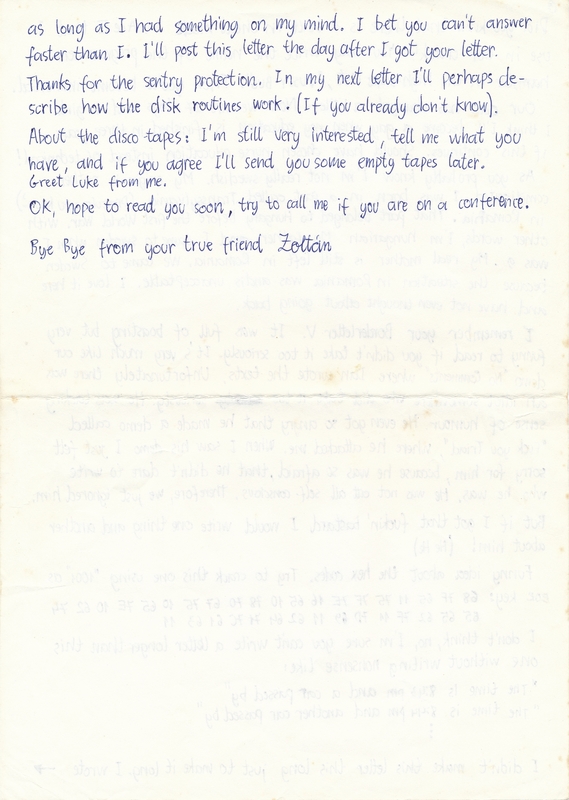 Finally, the letters document Mr. Z’s pullout from Triad and from the scene altogether – with school and “real life” taking hold over someone whose group was adored by tens of thousands computer kids worldwide.